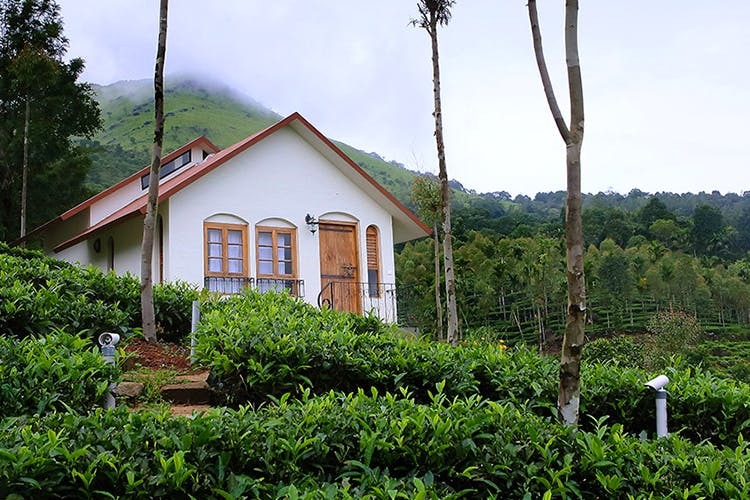 For a much-needed break, take to Tea Terrace, a resort in Vythiri which is situated on a hillside and offers spectacular views of tea gardens from your homely cottage. Flee to the hills, away from all your city woes, for a serene stay at Tea Terrace. A resort in Vythiri (a town in Wayanad), Tea Terrace is made up of little cottages set upon a terraced tea garden on a hill — aptly named! Perfect for a family stay, stunning views are guaranteed here with lush green landscapes as far as the eye can see. Surrounded by hills and overlooking a valley, the nature enthusiast in you will have a field day here. Don’t forget to bring the camera along, as you’re bound to get some lovely shots at this scenic locale. The cottages, inspired by Spanish architecture, only add to the charm of the whole setting. Neat and minimal, each cottage has a balcony or patio and comes with private bathrooms. Done up with wooden interiors, expect charming old-school four-poster beds and writing desks in your room. Come evening, prepare for a grilled and meaty meal as you set up a barbecue, with the mountains as a backdrop. It’s like what you see in the movies! Other activities you can get up to while you’re here include hiking and long strolls in the garden. Or pick up a book from their library to bury your nose into. Nothing quite like the cool breeze, a good book, and a cup of piping tea to heal the soul. And in the middle of a tea plantation, who needs any other beverage. Head out for a spot of sightseeing and visit Karlad Lake, Banasura Sagar Dam and Pookode Lake that are all a short ride away from the resort. So get to planning your next getaway and book your rooms at Tea Terrace right away. They also offer Honeymoon packages. So, a romantic getaway, maybe?